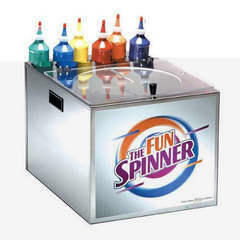 Easy to use; we supply spin art machine, bright and vibrant colors of spin art fast dry paint to be used by the drop (there will be paint left over!) Also includes ready to use Spin Art 'cards' for children to make a total of 50 take home craft projects. Spin Art cards can be used as post cards to send invitations, thank you notes, or post cards to grandma, grandpa, and other family and friends. FREE SUPPLIES COME WITH THIS MACHINE...... We will supply you with 50 ready to use cards with colorful fast dry paint in containers/squeeze bottles. Let us know how many refills you need if 50 isn't enough for your party/event.